The Rembe family makes the fragrant, luxurious beard care products in this box on their lavender farm. If there's a heaven, we bet it's a lot like the organic family lavender farm and inn in New Mexico where the Rembe family makes the fragrant and luxurious man care products in this set. 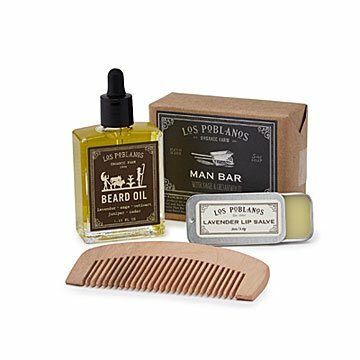 The small-batch box for the bearded contains sophisticated, earthy, oils and scents. Cold pressed Man Bar Soap contains natural sage and cedar, along with no less than six naturally soothing and moisturizing oils. The Organic Beard Oil and Lip Salve both boast Rembe family lavender. The beard comb is made of natural peach wood. Together, they give a man precious moments of the sweet life every morning. Handmade in Albuquerque, New Mexico. Three generations of the Rembe Family have owned and operated the organic farm where they grow their intensely fragrant lavender. In 1976, Penny and Armin Rembe purchased half the property where they raised their four children and maintained the property as gentlemen farmers. In 1999, the second half of the property, which included La Quinta Cultural Center, came up for sale and was under threat of being developed. Together with their four children, they decided to reunite the properties and preserve the architecture, gardens, and open farmland by running it as a two-part business: inn and store. Penny and Armin planted lavender because it uses less water than many crops, and doesn’t deplete the soil. While "retired," Penny and Armin ran the inn for five years. In 2004, their son Matthew Rembe took over and has developed all areas of the business, from expanding the lavender spa product brand to the addition of guest rooms, fine dining, and cultural programming.